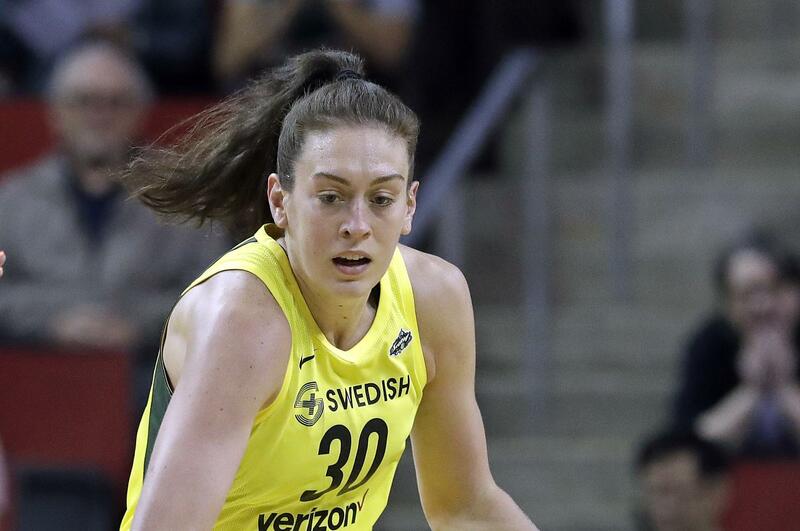 Sun., May 27, 2018, 8:31 p.m.
LAS VEGAS – Breanna Stewart had 23 points and nine rebounds, Jewell Loyd added 20 and nine assists and the Seattle Storm beat Las Vegas 105-98 on Sunday night in the Aces’ first game at the Mandalay Bay Events Center. Natasha Howard added 18 points on 7-of-8 shooting, Kaleena Mosqueda-Lewis had 13 and Sue Bird 10 for the Storm (3-1). Seattle shot 52 percent from the field and 46.2 percent from behind the arc, where Mosqueda-Lewis hit 3 of 3. Loyd and Alysha Clark hit back-to-back 3-pointers and Breanna Stewart scored seven consecutive points before a layup by Loyd capped a 15-0 run that gave Seattle a 23-14 lead late in the first quarter. After Nia Coffey’s jumper gave the Aces a 14-8 lead about four minutes in, they went 0 for 5 from the field, 0 for 2 from the free-throw line and committed three turnovers over the next 4 1/2 minutes. Sue Bird hit a 3 just before the buzzer that made it 53-35 at the break and her jumper early in the second half gave Seattle its biggest lead at 59-40. Las Vegas answered with a 22-9 run, capped by Coffey’s 3-pointer, to trim its deficit to 98-94 with 1:39 to play, but Bird answered with a 3 and the Aces got no closer. A’ja Wilson, the first overall pick this year, led Las Vegas with a season-high 27 points. Coffey, the fifth pick in 2017, scored a career-high 23. McBride, making her season debut after finishing her season in the Turkish Women’s Basketball League, had 21 points. Published: May 27, 2018, 8:31 p.m.